If you are beginning to plan outdoor renovations and are interested in updating your walk ways, consider using traditional indoor tiling outside. This is a great way to give your home a more personal touch. Tiling the outdoors can improve your garden or turn your outdoor patio into a stylish new hangout spot. It may be a little too cold to consider spending time out doors, but with the right tile design, you might feel the urge to begin your renovations sooner rather then later. Outdoor areas have become an extension of our internal living areas, extending a deck, patio or tiling around a pool makes perfect sense. Most materials used outside need continuous maintenance and most often deteriorate and fade with sun exposure. This is why the perfect covering for your outdoor living spaces are outdoor tiles. 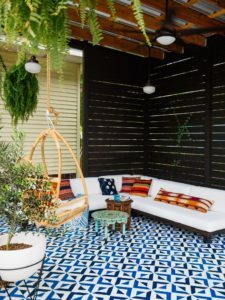 Geometric Floor Tile Stencils from Royal Design Studio – Painted Concrete Tiles – Mediterranean Jungalow Patio Porch Makeover by Old Brand New. Color scheme can be simple or fun it all depends on your taste. If you like matching the pavement tiles with your house paint then go for a matching scheme. You can also go for neutral colors like whites, browns, greys and blacks if going for a subdued look. But if you want a contrasting color then the options are unlimited as natural stones come in a variety of beautiful colors. Gorgeous outdoor dining area by Zevy Joy. This is an extremely important question as it helps in selecting the right material for your project. If the project is a space that experiences heavy foot traffic and is prone to heavy level of abuse then it is better to go with tiles that are heavy duty. 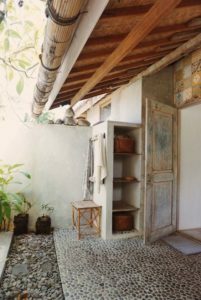 Similarly some stone tiles are better off on the walls rather than on the floor. Knowing the location where you want the tiles to be placed helps you in deciding the perfect material for your project. 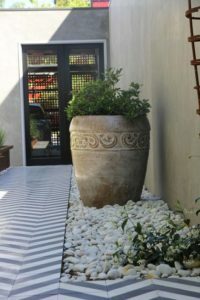 Tiles of Ezra Ceent encaustic tile black and white herringbone earthy floor tiles for external courtyard with planter. Tile Installation can either be done by a professional contractor or as a DIY project. However, in some rare circumstances professional help is mandatory especially when it comes to setting up tiles in the outdoor areas. But most of the time, a pro isn’t needed and the entire installation process can be done with the basic knowledge and understanding of creating the foundation level.